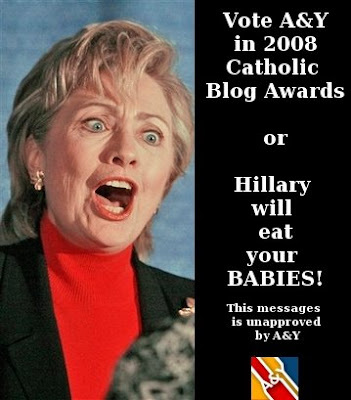 Remember, the 2008 Catholic Blog Awards will be wrapping up shortly. There has been some recent negative campaigning going around about the Alive and Young Blog as well as with other blogs and bloggers too. I assure you all that what has been said about the Alive and Young blog is false (unless it is something positive -- like saving a family of kittens from a burning building, which I did just last night) but everything said about my opponents is true (unless it is positive, then it is false); in fact it is doubly true. Some bloggers have been throwing out various political cards "Vote for me, I'm a woman." "Vote for me, I'm a man." "Vote for me. I'm a college student, or a priest or whatever." "Vote for me. I have two legs." Ultimately there is only one reason that trumps all other reason on why it is imperative to the well being of Catholics and America if you don't vote for Alive and Young. Failure to vote for Alive and Young puts all of the know existence in jeopardy, for a failure to vote for A&Y means that Hillary Clinton will eat your babies. Do your babies really want to be devoured by Hillary? Do you really want your babies turned into a 90 calorie snack pack for this fiendish lady? If you don't then vote Alive and Young in this year's Catholic Blog Awards or else bad things will happen.